Acknowledged author wrote DEGARMOS'S MATERIALS & PROCESSES IN MANUFACTURING 12 comprising 864 pages back in 2016. Textbook and etextbook are published under ISBN 1118987675 and 9781118987674. 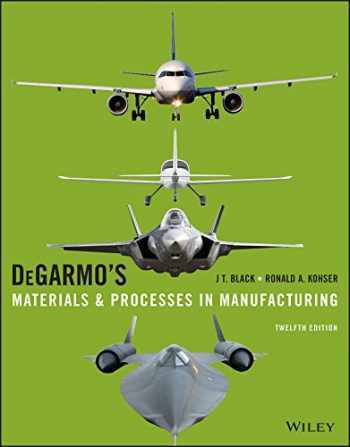 Since then DEGARMOS'S MATERIALS & PROCESSES IN MANUFACTURING 12 textbook received total rating of 3.5 stars and was available to sell back to BooksRun online for the top buyback price of $85.75 or rent at the marketplace. Newly revised for its twelfth edition, DeGarmo's Materials and Processes in Manufacturing, 12th Edition continues to be a market-leading text on manufacturing and manufacturing processes courses for over fifty years. Authors J T. Black and Ron Kohser have continued this book's long and distinguished tradition of exceedingly clear presentation and highly practical approach to materials and processes, presenting mathematical models and analytical equations only when they enhance the basic understanding of the material. Updated to reflect all current practices, standards, and materials, the twelfth edition has new coverage of additive manufacturing, lean engineering, and processes related to ceramics, polymers, and plastics.